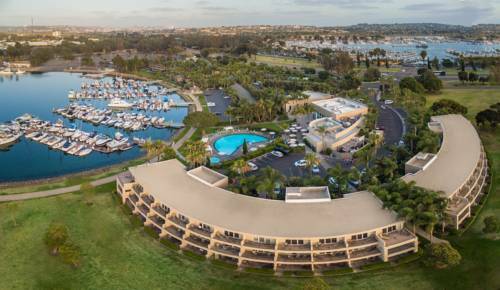 The Dana on Mission Bay by SeaWorld is nestled on 10 acres in Mission Bay Park. The hotel is the closest hotel to SeaWorld and offers transportation to SeaWorld daily. It is just minutes from all of San Diegos major attractions including the San Diego Zoo- Balboa Park and Gaslamp Quarter. The hotel is less than a mile from the beach. Hotel facilities include two outdoor pools and Jacuzzis-onsite bike and water sport rentals-adjacent to 25 mile long bike and jogging path. Hotel provides shuttle service to and from the airport- cruise ship terminal and the Amtrak station for minimal fee. The Dana Boarding Pass Resort fee costs 9USD per room per night and includes a variety of inclusions. See services for full description. Accommodations are located in two distinct areas of the property- Marina Cove and Waters Edge. The Waters Edge guest rooms and suites are located in two sweeping curvilinear three-story buildings overlooking Mission Bay and were constructed in 2004. The Marina Cove accommodations are centrally located on the property-have been recently renovated-and offer marina views- pool views-courtyard views-and non-view rooms. Firefly Restaurant and Bar: Firefly Restaurant and Bar features a contemporary atmosphere and innovative cuisine unique to Southern California. Beautiful views of Mission Bay are available from all outdoor and most indoor tables. Perfect for a relaxing meal or cocktail. Sunset Room: Section of Mission Bay Ballroom. Bayside Conference Room: Beautiful Conference Room located in our Water's Edge Building. Room has floor to ceiling windows overlooking Mission Bay and the marina. The Dana on Mission Bay by SeaWorld is nestled on 10 acres in Mission Bay Park. The hotel is less than a mile from the beach and Belmont Park. The Dana on Mission Bay is the closest hotel to SeaWorld and offers transportation to SeaWorld daily. It is just minutes from all of San Diegos major attractions including the San Diego Zoo- Balboa Park and Gaslamp Quarter.